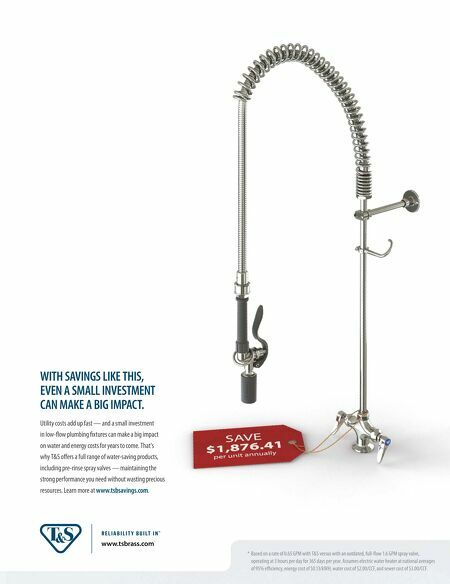 40 • FOODSERVICE EQUIPMENT & SUPPLIES • NOVEMBER 2018 6. SEATS WITH A VIEW Adding to the theater aspect, more op- erators are incorporating chef's tables and counter seating to their operations to offer customers a prime view of the action. Proxi has about eight spots set up directly at the restaurant's main expo line across from the window to the kitchen's wood-red grill/oven, allow- ing guests to chat directly with the chef. "I'm seeing more restaurants interested in chef's tables for off-hour education, like pizza-making classes or other special events," Grondin says. Counter seating offers diners an additional choice in watching the action close-up. For those preferring a more traditional dining room setting, Grondin says, furniture selection depends on whether the restaurant owner wants guests to linger longer (in that case comfort takes precedence), or prefers to turn tables faster (less padding). "The furnishing choice has a direct impact on operations and the overall feel and energy of a space," Grondin says. Spacing tables closer together or further apart can also impact the energy in a space. 7. FOOD DISPLAYS AND MERCHANDISING The fast-casual segment is killing it in terms of upscale food merchandising. Clean eating, transparency-focused Sweetgreen is a perfect example of this, Grondin points out. There, diners pass by rows of glass and open displays lled to the brim with colorful crock pots, baskets of fresh produce and large smoothie machines with multicolored vegetables. Chalkboard signs and other displays with handwritten notes all combine to signal notions of craft and small-batch menu items. "All this is meant to evoke that you're going to eat good quality, homemade food, or you're in Grandma's kitchen," Grondin says. Stainless steel industrial is out; homey and colorful is in. Of course, tabletop feeds into this enhanced focus on food presentation. From more colorful plates to uniquely shaped vessels, individual serving size pots, cool pottery and more, tabletop selection further tells the story of the food diners are being served. Even server and staff uniforms are more thought-out these days. "More restaurants are ditching the stuffy ties for waste aprons, fun T-shirts and denim that also offer opportunities for merchandising branded items for purchase," Szala says. 8. PACKAGING AND BRANDING Aside from uniforms, packaging and paper-based presentation items also offer enhanced tools for branding and merchandising. Szala says he works with his clients to add logos and branding on every- thing from to-go bags to paper liners for baskets, cups, glassware, napkins and more. At the recently opened Dutch and Doc's in Chicago, paper- based plate liners for deviled eggs come printed with the restaurant's logo, as does the package of hand towels for cleanup after Thai-style sticky ribs. "These are just additional touch- points where you can bolster your brand, create more of an experience and remind guests to come back," Szala says. 9. GAMING AND ENTERTAINMENT Some restaurants are taking the notion of experience to a whole new level, melding food and drink with actual game playing like ping pong, darts, bowling, arcades and more. "Millennials in particular seem to be craving these kinds of immersive experiences while also enjoying high- quality food and drink," says Robert Thompson, founder and CEO of Denver-based Punch Bowl Social. 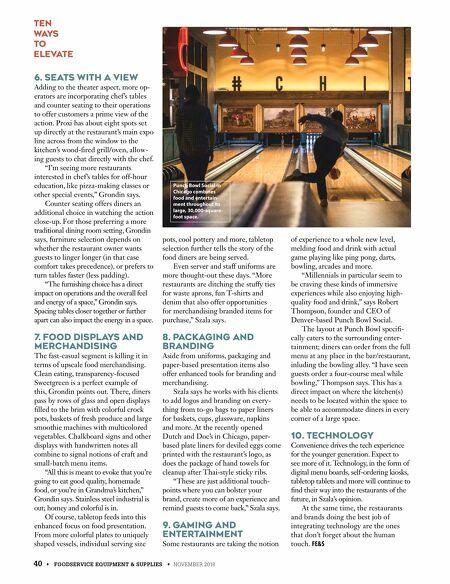 The layout at Punch Bowl speci- cally caters to the surrounding enter- tainment; diners can order from the full menu at any place in the bar/restaurant, inluding the bowling alley. "I have seen guests order a four-course meal while bowling," Thompson says. This has a direct impact on where the kitchen(s) needs to be located within the space to be able to accommodate diners in every corner of a large space. 10. TECHNOLOGY Convenience drives the tech experience for the younger generation. Expect to see more of it. Technology, in the form of digital menu boards, self-ordering kiosks, tabletop tablets and more will continue to nd their way into the restaurants of the future, in Szala's opinion. At the same time, the restaurants and brands doing the best job of integrating technology are the ones that don't forget about the human touch. FE&S Ten Ways to Elevate Punch Bowl Social in Chicago combines food and entertain- ment throughout its large, 30,000-square- foot space.